Very high temperature chamber furnaces 1700°C. RH range up to 1700°C. 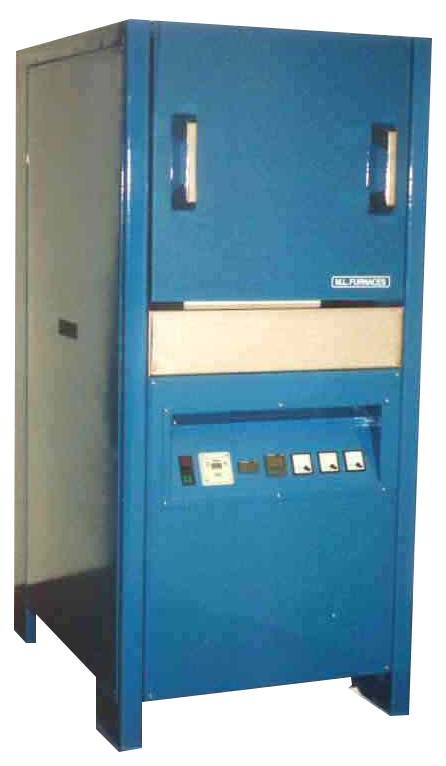 Very high temperature furnaces are constructed using a robust floor standing casing attractively finished in blue paintwork. A double skin construction with thermostatically controlled ventilation fans ensures that the furnace casing remains relatively cool. The furnace lining consists of high efficiency graded low thermal mass insulation to reduce heat losses and enhance a uniform working zone. A hard wearing removable tile forms the furnace hearth. The spring operated (or optionally electrically operated) vertically lifting full width door affords obstruction free access to the work chamber and keeps the hot face away from the operator at all times. A polished stainless steel shelf is fitted below. Heating: The heating elements are molybdenum disilicide U shaped elements mounted vertically in recesses in the work chamber sides. The elements are on low voltage provided by an integral transformer, and power switching is by means of thyristors for accuracy and reliability. Heating elements can be quickly and easily replaced should this become necessary. Controls: The controls are below the furnace body and set an angle for ease of vision. A microprocessor based digital temperature controller with set-point and process displays, provides accurate fully automatic control. An adjustable independent digital over-temperature protection controller is fitted as standard. Controls include thermocouple break protection. Options include: alternative models of temperature controls / programmers / recorders / communications / timers etc. Heating rates vary between models, for example: RH1 0 -1600°C. 10 mins. RH4 0 -1600°C. 30 mins. Larger versions and 1800°C versions can be made to order. Performance my alter due to mains voltage fluctuation and ambient temperatures etc.